Well, this year’s off to a fun start! I’ve been trying to make an effort to try more new things, such as the crystals 101 session I attended the other night, and now I just got to participate in the breaking of a Guinness World Record! How fun is that?! 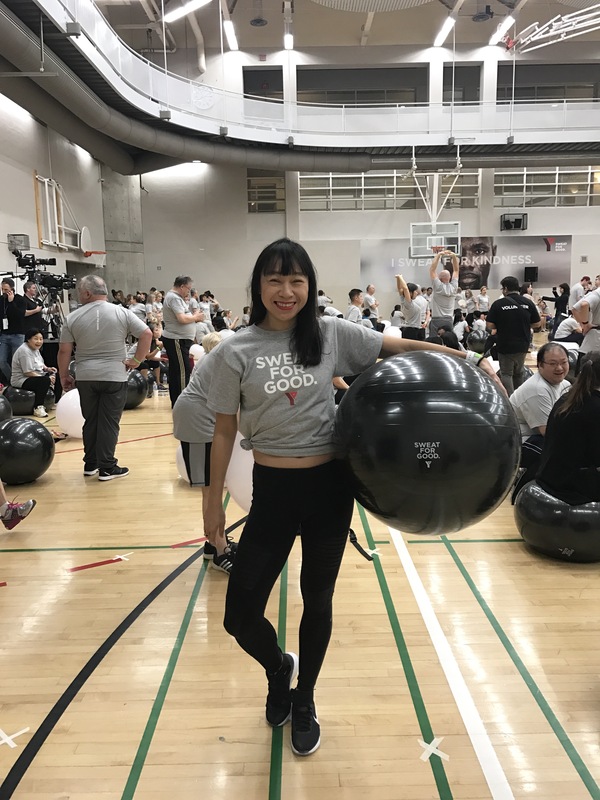 Yesterday at the YMCA, I was one of the 454 participants in the world’s largest exercise ball class, and we broke the record by merely one person! The energy in the room was great and the half-hour class flew by. We were lead by none other than Eva Redpath, who I’ve known for some while now, and as always she made it an engaging workout that had us all bouncing, lifting and sweating it out early in the morning. I expected nothing less when I heard she was leading the class. Why the attempt at breaking the world record? 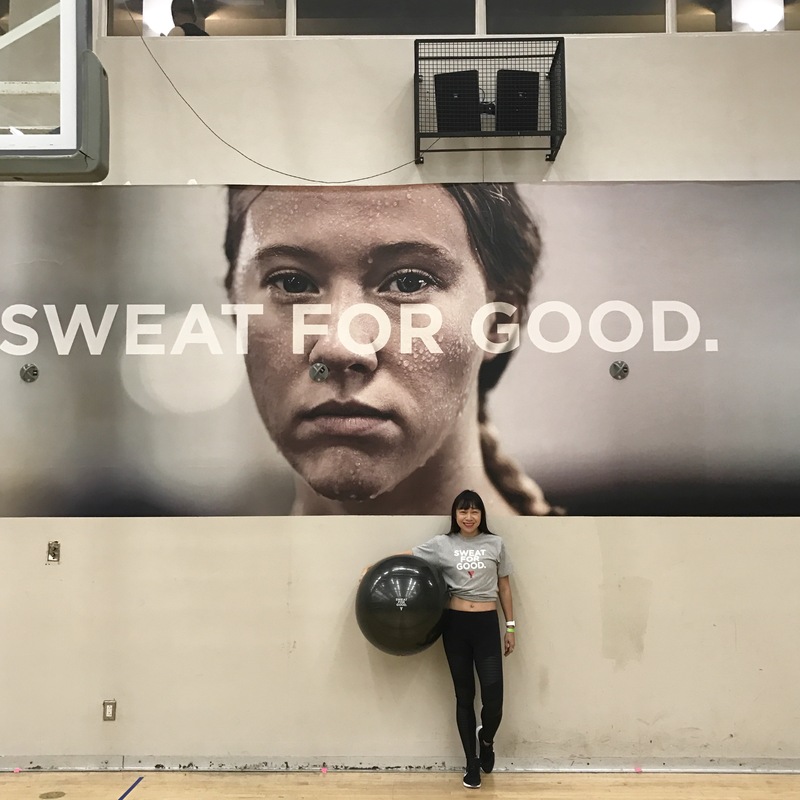 We were there as part of the YMCA GTA’s Sweat for Good campaign. No matter where and how you exercise, we all sweat. Same same, right? 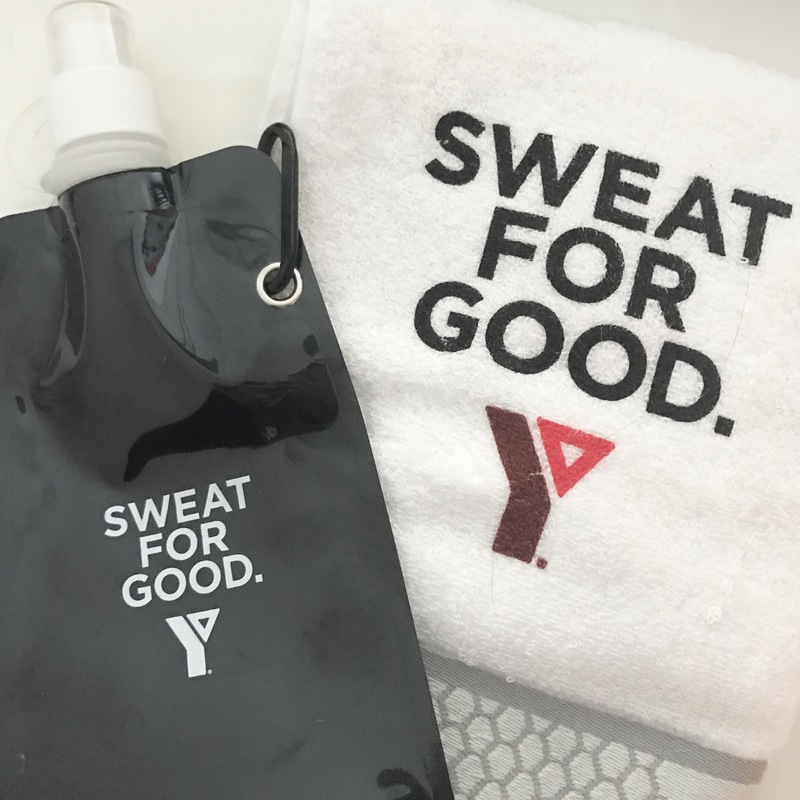 But when you exercise at the YMCA, you sweat for good. The YMCA GTA offers programs and services dedicated to the physical, mental and social health of Torontonians of all ages. And by choosing to make the YMCA GTA your gym, you become a part of this community that helps strengthen Toronto as a vibrant, healthy society. Although I haven’t had a gym membership in a while (I typically run outside and then mix in a variety of other workouts here and there), I do have really fond memories of the YMCA. I used to go swimming as a kid there, and I remember meeting up with friends every weekend to walk there and the smell of chlorine always takes me right back to those fun times in the pool. I remember we would also use the sauna afterwards, just to warm up afterwards (I bet that the women weren’t too fond of us kids in there now that I think about it, but we were pretty well-behaved kids). I also took gymnastics and dance lessons at the Y. Practicing roundoffs and cartwheels and headstands on the mat, learning jazz ballet choreography—so much of my fun as a kid took place at the Y. And having been to the YMCA a couple of times recently, I love seeing that it’s still thriving with members of all ages. It’s easy to see why, though; the facilities are top notch. 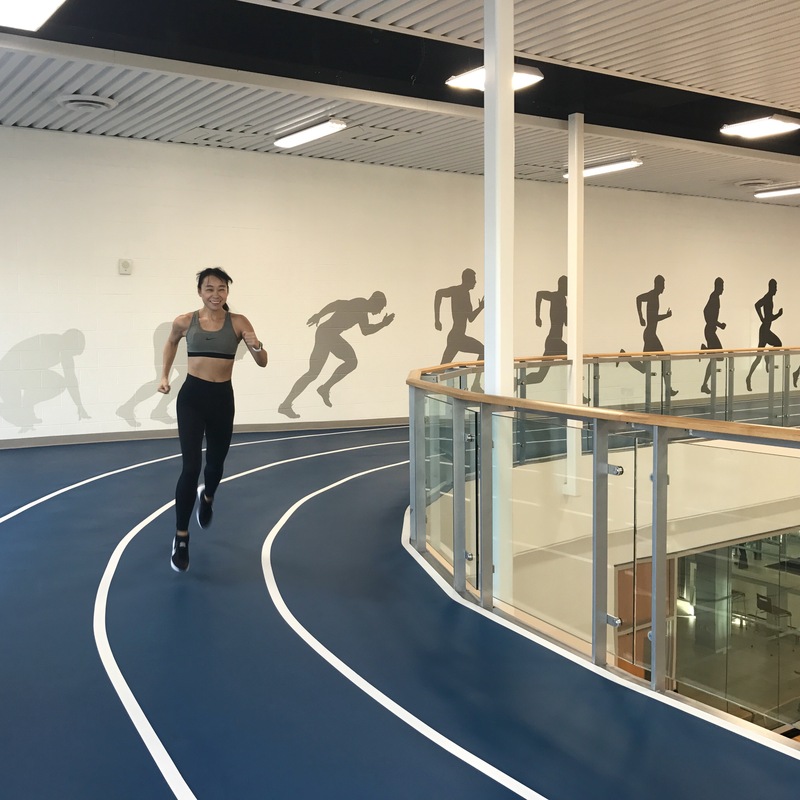 From the wide variety of gym equipment to the awesome running track (although I think it was the badminton players I saw in the gym that was most envious of—so fun! ), to sweat for good in such a welcoming community is a great thing. I have no idea what took me so long to realize this, but I much prefer outdoor workouts. I will almost always opt to run outside over the treadmill or an indoor track. 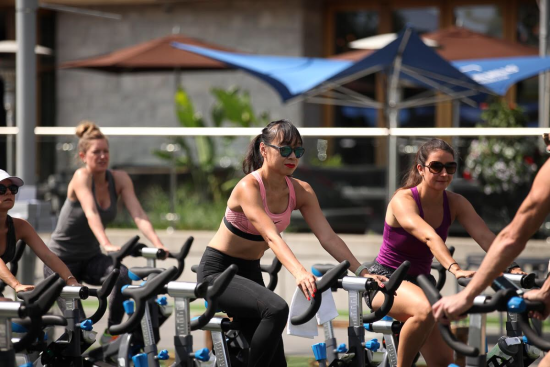 And when it comes to yoga and group cycle classes–workouts that in and of themselves, I’m not personally a huge fan of–I’ve actually enjoyed when done outside with the breeze, blue skies, and sunshine. Which is why I’m totally into the outdoor exercise classes being held all summer long at CF Shops at Don Mills. They’ve got both group cycle classes and yoga all season held in the Town Square. I had a chance to try out the group cycle class last week and I found it much more fun than being in a dark studio. 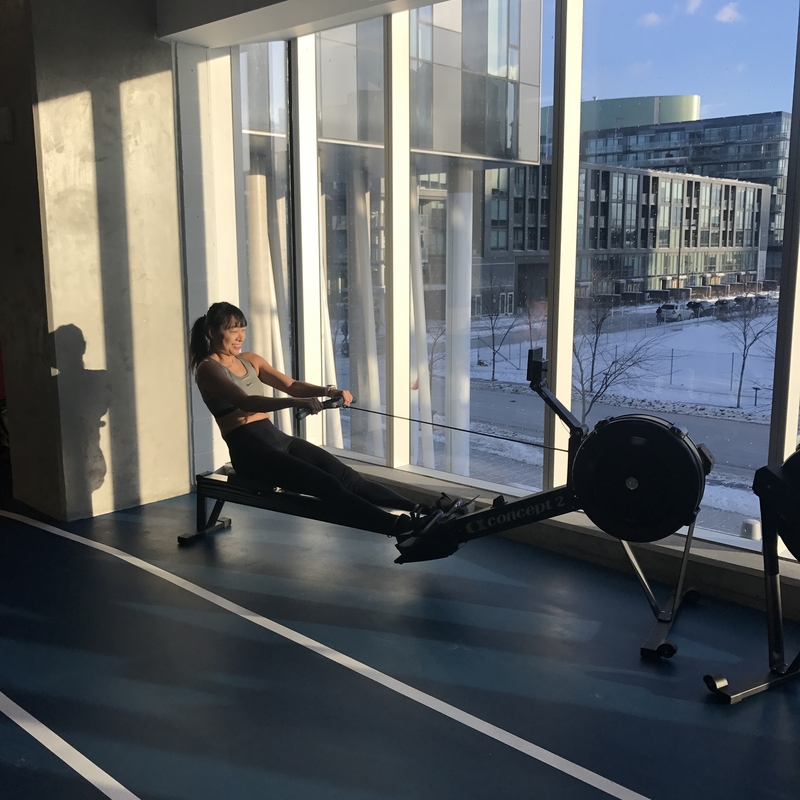 Plus, here’s another great reason to take advantage of these summer classes at CF Shops at Don Mills: you work up a sweat and can tick off your workout of the day from your to-do list, then you’re right at this great open-air shopping centre (did you know it’s Ontario’s first open-air mall of its type? ), so you can treat yourself right away to both some retail therapy, and a delicious bite to refuel. If you live nearby or it’s easy for you to get to, I recommend going to check it out. And, hello, the yoga classes are free! You can’t beat that price! 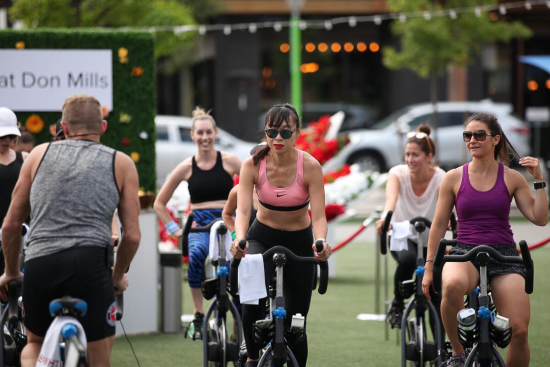 Plus, the 50-minute group cycle classes are a very reasonable $15. Group cycle classes run every Tuesday and Thursday from now until August 31st at 9:30 a.m., 12:15 p.m. and 5:30 pm. The class happens rain or shine (the class is indoors if it’s raining btw). Just bring your running or Spin shoes. The complimentary yoga classes happen every Sunday from now until September 3rd from 10:30 a.m. until 11:30 a.m. (and only if the weather permits — if it’s raining, class is cancelled). BYOM. That’s bring your own mat, but you yogis probably got that. You do have to reserve your spot online, though! To register, head over to CF Shops at Don Mills to snag a spot in a class. I’m hoping to round up some friends to go this summer, so maybe I’ll see you there! 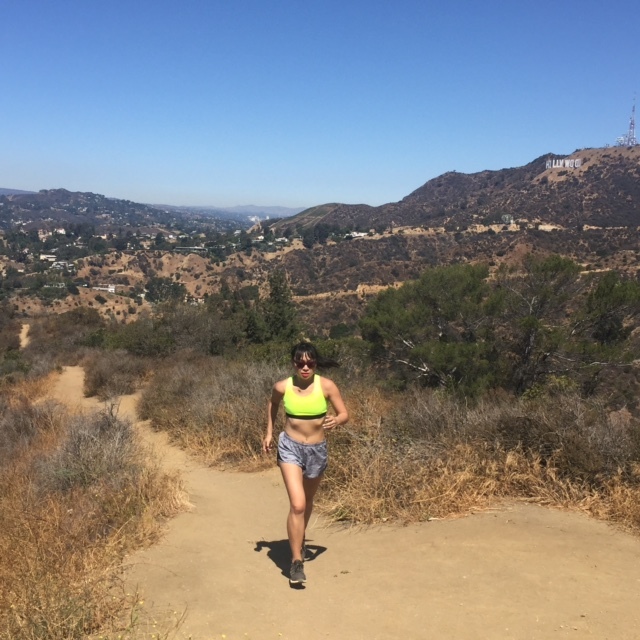 Between running a minimum of three times a week and then other workouts thrown into my routine as well (from Spinning to dance class), I go through a lot of activewear in a week. Add in wearing some of that gear for going out (hello, athleisure! ), well, my fit gear gets a lot of use, and it gets real sweaty in the process. And so I do laundry at least once a week of just my activewear. But as I’ve come to realize (in an embarrassing way — more on that later) is that clean doesn’t exactly mean fresh smelling. The performance fabrics that activewear is made with consists of synthetic fibres, which can trap odour if you’re not diligent with how you care for them, resulting in a not-so-pretty scent referred to as “rebloom.” That shameful incident I referred to above? Well, I’ve become familiar with this rebloom when I’ve thrown on a sports bra — a clean one — to head out for brunch and as I stepped out the door, I noticed a peculiar scent, which to my horror was from this fresh from the laundry sports bra. Well, as I definitely don’t want any malodorous rebloom emanating from me, I’ve changed up my laundry routine and have partnered with Tide with their new product. 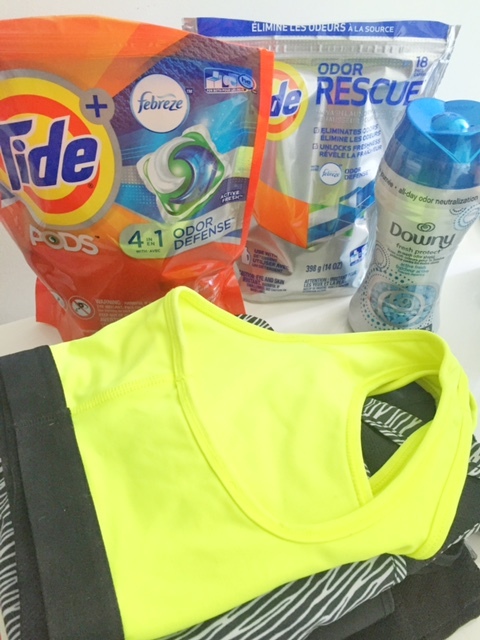 Now my gear is getting into fresh smelling shape with the Tide + Downy Odor Defense Collection. It’s specifically designed to fight against rebloom; you can use it for all of your laundry but it’s especially great with activewear, given the synthetic fabric content of these pieces. Its rebloom-eliminating power comes from Febreze Odor Defense technology, which goes to task at breaking down organic compounds and body soils (ew!) deep down to the level of the fibres. It’s a trifecta of products that work as a team to eliminate this rebloom: there’s Tide Pods plus Febreze Odor Defense (cleans and removes stains); Tide Rescue with Febreze Odor Defense (greasy body soils and odours deep in the fibres begone! ); and Downy Fresh Protect with Febreze Odor Defense is the third product, which is what gives your clothing 24 hours of freshness. Since you can use it on all of your clothes, it doesn’t call for a whole separate set of products just for your activewear (and you don’t want rebloom in any of your clothes, after all), so it’s what I’ve switched to. And now I can leave the house and not have to worry about my clean clothes giving off anything but the freshest of scents. I may return with them soaked and grubby from a sweaty workout, but I know that my new Tide routine will take care of that. Disclosure: I created this blog post as an ambassador for Tide. All opinions and advice are my own and I only work with companies I genuinely love and have used prior to being contracted.